Whitewater River Levee Certification: Hydrology and Hydraulics (CA) | WEST Consultants, Inc. 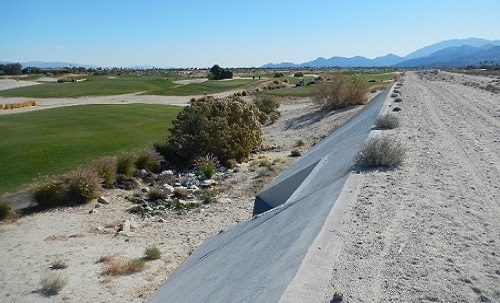 In Phase I of the Whitewater River Levee Certification, WEST Consultants conducted field reconnaissance and collected available data for the Whitewater River located on the eastern side of Palm Springs, California. During Phase II, WEST determined return interval discharges, developed an HEC-RAS hydraulic model of the Whitewater River and its tributary Chino Canyon Creek, performed interior drainage analysis, and evaluated lateral migration and levee toe scour potential of the Whitewater River. Interior drainage analysis was performed to ascertain flooding extents from backwater effects due to high flow in the Whitewater River or Chino Canyon Creek. Results indicated possible flooding. WEST provided a recommendation for interior flooding mitigation by installing flap gates at specified locations. The potential for lateral migration of the stream centerline was evaluated utilizing HEC-RAS model results, historical aerial imagery, regime equations, and engineering judgement. Where lateral migration seemed problematic, concrete levee bank protection and foundation stability were evaluated by calculating the potential for toe scour.